On July 15, 2011, Chancey Blackburn, EVP Sales and Marketing for Pickle Programs, participated in the panel discussion, “Make Technology Work Harder For Your Bottom Line” at the 38th Annual Conclave Learning conference in Minneapolis. Chancey joined other management executives to discuss how broadcasters can utilize new technologies to run their businesses more effectively and efficiently. 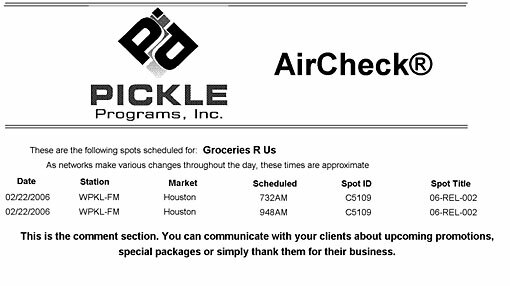 Chancey explained the time savings obtained when Pickle Programs’ AirCheck™ software is utilized to automatically distribute spot times to advertisers. The software also makes it possible to post an ad schedule within the flight to prevent credits and write offs from under-delivery. Other panelists included Scott Musgrave, EVP of Business Development for MediaDash and David Einstein from Efficio Solutions. Warren Kurtzman of Coleman Insights moderated the panel. Do more with less isn’t just radio’s operating standard. A new survey shows two-thirds of marketers are being told by their companies to drive more sales with the same or lower budget — and three-quarters say their marketing budget has shrunk this year. Facing that challenge, accountability has taken on a much greater significance. The survey was conducted by Association of National Advertisers (ANA) and Marketing Management Analytics (MMA). ANA president Bob Liodice says, “With marketers, CFO’s and CEOs paying more attention to each dollar spent, marketing accountability processes have become strategic imperatives.” That’s where radio posting becomes a factor. Radio Advertising Bureau CEO Jeff Haley says such accountability is “an important component” of radio’s growth. “As radio aims to grow its share of ad dollars, proof of performance and streamlined commercial workflow are increasingly important at the station level,” he says. Radio One has begun rolling out its “Accountability One”, posting software, (by Pickle Programs), to all markets and its timing couldn’t be better. MMA SVP Douglas Brooks says, “With the economy still struggling to find its way out of the doldrums, marketing accountability has moved from the category of nice to have to must-have.” Virtually all (92%) the firms that took part in the ANA-MMA survey say they’re taking steps to improve marketing effectiveness without spending more. Seven in ten say they’re doing that by shifting from traditional to digital media with more than half (53%) shifting from brand-building to promotional marketing. But there’s good news for radio too. Nearly four-in-ten (38%) are shifting to lower-cost media. “Posting” of radio ads’ performance PPM ratings is now possible within two or three weeks. As new technology allows PPM posting, Radio One embraces it across all markets. Agencies embrace Pickle, but the RAB’s guidelines remain more conservative. "Oh, and the Clients wants you to call in their times each day"
Giving Your Advertisers the Time(s) of Day! The Clients want their times. How many times has a Traffic person heard that phrase? In some cases, it’s a fairly easy task because the schedules are rather uncreative and follow a pre-set pattern. But for the more sophisticated schedule, it’s just one more time-intensive project to dump on an already over-worked staff. We found one solution that takes the station personnel out of that workload. A software program called AirCheck and a companion add-on: RunCheck. Stations have all sorts of solutions. One is to have a junior member of the staff sit by the phone each afternoon after the next day’s log has been run and liter ally call each client that wants the service. An Office Manager or Business Manager can tell you—that’s an “almost” non-productive task and very prone to human error. Another solution is to give the Salesperson the printout of spot times, usu ally via a printout delivered to his desk and saying: “Good luck, big boy, and happy phone calling. If the salesperson was a producer, this is another real cost to the bottom line. In frustration, most Stations simply say—we don’t provide times in advance of Broadcast. The hardest thing in selling is to tell an advertiser or potential advertiser: No, we don’t do that or can’t do that. More than one TDGA Member has come to us asking—how do you handle that. Actu ally, we knew of one New Jersey Station that charged 50-cents a day to call in times to a client. Of the hundreds of accounts (it was a busy station), less than 1% ever agreed to pay for that service—but the requests didn’t stop. It was even more difficult when competitors did it as a part of their service to the client. So we embarked on tracking down the solution. The material being sent can be customized replacing the sample logos shown with your station or corporate branding and the text offers a nice promo tool to alert advertisers to upcoming advertising opportunities. Space limitations required us to condense the screen shots, but they can be seen in far more detail on the company’s website. 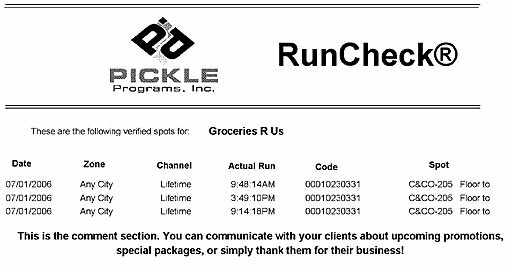 AirCheck provides the times and copy identifier in advance of the advertisers broadcast, while RunCheck provides a quick report following broadcast. This might be just what you’re looking for and certainly worth discussing within your own Management and Sales Department circle. Pickle can be set to send either scheduled or verified spot times (or both). The times are taken from completed logs or verification reports. Data Entry in Pickle is quick and easy and only needs to happen once per client in order for them to receive times for all orders. Advertisers can choose to receive their times by fax, email or both – up to two fax numbers and up to 4 email addresses. The information is client specific and can include or exclude spot rates and bonus or fill times. Pickle can even send schedule data in Spanish. Pickle can reside on your station(s)’ network so it can be easily accessed by multiple users. Addition ally, a log is kept of all emails and faxes sent each day for quick reference and confirmation. In short, these programs, one or the other (or both) means no more calling, faxing or emailing. Pickle does the work reliably and accurately every day – even when you’re not there! Your sales team will also appreciate how easy it is to set up their clients to receive their times. And they can include a custom message on the fax or email, telling the client about a new sales package, a promotion or just to thank them for their business. If you want to check it out, we found the folks at Pickle Programs to be very open, friendly and easy to get the answers you’re looking for. In the interest of full disclosure, they are members of TDGA and advertise on our website. You can click on their banner or contact them directly. Log onto their website: www.pickleprograms.com, email contact is sales@pickleprograms.com, or call 888.593.0107.